Keeping up your end as a responsible pet owner benefits everyone. As a prospective member of a Springs community, here are some of the fine points about renting with pets that might not have occurred to you. Our Springs pet policy is explicitly stated on our website, so you know exactly what to expect. Smuggling a pet into an apartment where they're not permitted may seem like a good idea at the time, but contraband cats and dogs are hard to conceal and things are likely to end poorly. No, we don't care whether or not your pet is a blue-ribbon winner. A "resume" simply documents information such as wellness visits, up-to-date vaccinations and spayed or neutered status, demonstrating that your pet is healthy and well-cared-for. If your pet has completed any behavioral training, this can be listed as well. If this is sounding like a job interview, in a way it is. You want to portray yourself and your pet in the best light possible. A third-party reference, especially from a former landlord, offers an objective evaluation of your pet's good behavior. Just as you pay a deposit as insurance against any damage you or others may cause to the apartment, similar fees are assessed to cover possible pet damages. Make sure you're clear about the applicable charges in your case, whether it's a deposit, monthly fees or both. 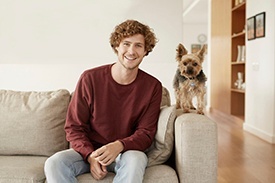 Renters insurance is a must-have for any apartment resident, regardless of pet ownership status. Double-check your policy for personal liability coverage and whether or not your pet is included. When it comes to amenities, we didn't forget our furry residents! Our Springs communities include leash-free dog parks where you and your pet can meet and socialize with other "families," along with pet spa areas to keep your dog looking fresh and clean. Stop by our leasing office today and learn more about why a Springs luxury apartment is the perfect home for you and your beloved pet!